There are many code editing software available today. But, which one is right for you? Both Atom and Sublime are great editing software. Each of them has its strengths and weaknesses. 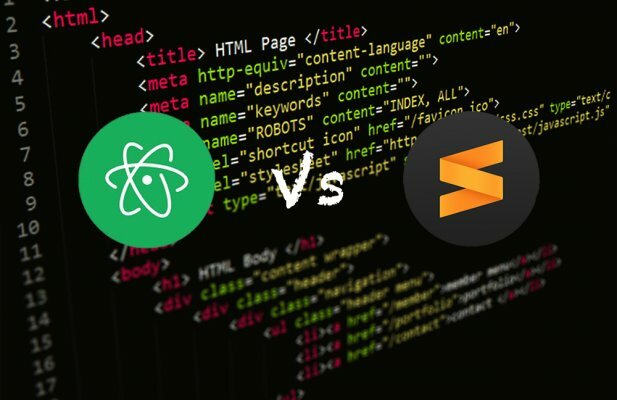 Today, I will compare Atom and Sublime to see which one is the better source editing software. The cost of the software will not play a big part in my decision making process because the difference between them is minimal. The cost for Sublime is a $70 licensing fee with the free trial. Atom, on the other hand, is a free software. Each of these softwares allows you to customize with plugins and themes. The biggest difference comes during the initial setup of the packages. Atom includes many standard packages in its setup. These pre-installed packages include package manager, tree viewer and settings view. The Sublime setup requires an extra step before you can start. This extra step is installing the package control plugin from the website. If I had to choose a software package, I would pick Atom simply for the commonly used packages as part of the pre-installation process. Once the installation of the software is complete, you are ready to run. Both Atom and Sublime have numerous plugins and themes to choose from, the problem I have is determining which one I need or want. Sublime has a little bit of an advantage here. Sublime has been around longer than Atom. Since Sublime is an older coding program, it has plugins and themes that are unique to itself. Some of these plugins or theme may not have anything remotely close in the Atom versions. But, Atom’s plugins and themes are all web-based designs so the ability to interact with other programs increases. While both of these apps operate OSX, Windows and Linux platforms, how it interacts with each platform is different. For example, Atom is written in HTML which allows easier interfacing with other web-based designed softwares, plugins and themes. This compatibility allows for even more options with plugins and themes. The approach to upgrades and enhancements is definitely different. Atom has consistent releases for both upgrades and enhancements. Many of these come from the end users trying to improve the product. Atom has a very open approach which encourages its community to continually update and make changes to increase the software’s performance and market standings. Sublime has taken a different approach. The upgrades and enhancements for Sublime are few and far between. Sublime uses an approach where a select few create and update the software with the enhancements. But even with few upgrades and enhancements, Sublime is stable. When I think of the two competitors, I would prefer using a package that has more frequent upgrades and enhancements. In my mind, that software is looking at the newer technology and keeping up with the changes. Although knowing Sublime is stable and time tested, it really is a matter of personal preference. When it comes to processing speed, Sublime pulls in front of large files. Sublime is able to handle multiple tasks simultaneously because of the faster processing speed. Atom struggles when it comes to processing large files quickly. The processing speed has been Atom’s achilles heel for a period of time but it is steadily working to reduce the issues of processing speed. I believe that Sublime is the winner in this area. How many times have you been working and it’s taking forever to load a file or perform a function? It’s very frustrating waiting for your computer and software to catch up to itself. With the consistent updates comes the required documentation for the changes and how to manual. Having the ability to go back and look how something was done or should be done is a great help. Also having everything in one location to look back on is a big time saver. The one location allows you to become more efficient because you do not have to create something from scratch and there’s no testing once completed. A documented script works and has completed testing. When you think about it, it all boils down to a matter of preference and what you are use to using. Many users do not like change! Changing a developers mind may take some time, but knowing the differences in the software is important to understanding what each of its strengths and weaknesses are and then making your software decision based on your knowledge.